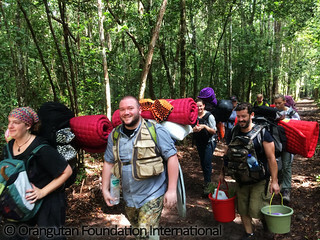 In July and August 2016, OFI volunteers spent three weeks walking over 100 kilometers apiece through forest trails riddled with roots, rivers, swamps, and huge fallen trees, collectively carrying 350 wooden planks and a whole camp’s worth of supplies and equipment (including a generator) and food (including giant sacks of rice), sometimes in the rain. The volunteers withstood crippling blisters, sprained ankles, shoulders rubbed raw by wood, bruises, cuts, infections, and all kinds of illness. This self-sacrifice was all done in support of one of the most challenging and important projects OFI has yet undertaken with its volunteer construction teams. 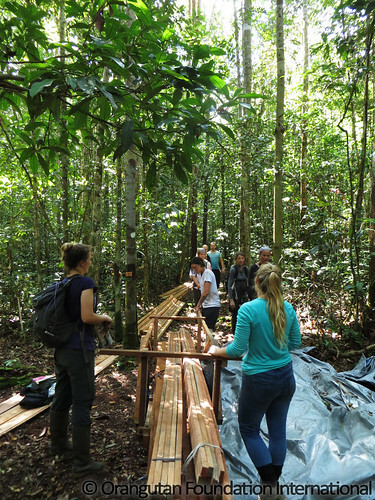 This year OFI’s volunteer construction teams were tasked with rebuilding an old patrol post at the edge of the Camp Leakey study area in Tanjung Puting National Park. 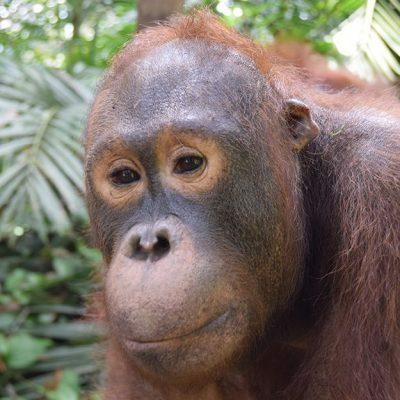 The post, named “Pos 17,” or Post 17 is seven kilometers (4.4 miles) from Camp Leakey and was built in 2002 primarily as a base for OFI rangers to patrol for illegal loggers. When the illegal logging problem died down and OFI started to focus its resources on more pressing issues, Post 17 was largely abandoned and fell into disrepair. 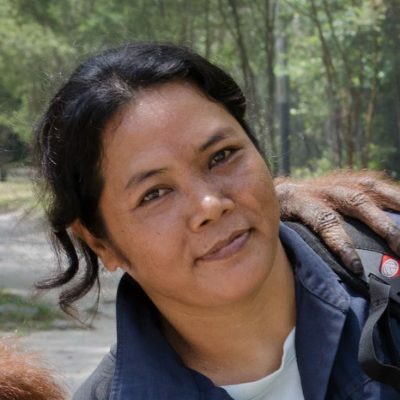 Now some years later, as live bird poaching and other illegal extractive activities arise in the National Park and the Camp Leakey study area, it has become apparent that renewed patrols are ever urgently needed to protect the forests and the biodiversity that supports wild orangutan existence. Team 1 started working hard on their very first day – a hot and humid day in early July mercilessly devoid of clouds. Still jet-lagged and culture-shocked, the team of nine loaded all 350 planks onto a truck, rode on top of them to the nearby port town of Kumai, unloaded the planks onto a boat, rode on top of them again for six hours until we reached Camp Leakey late at night, settled in, and then woke up without a full night’s sleep to unload all the planks again. For the next three weeks, days were occupied almost entirely with carrying wood on shoulders through the forest. The volunteers developed a relay system to get the wood progressively closer and closer to Post 17. Team 1 left having made extraordinary progress towards the end goal. 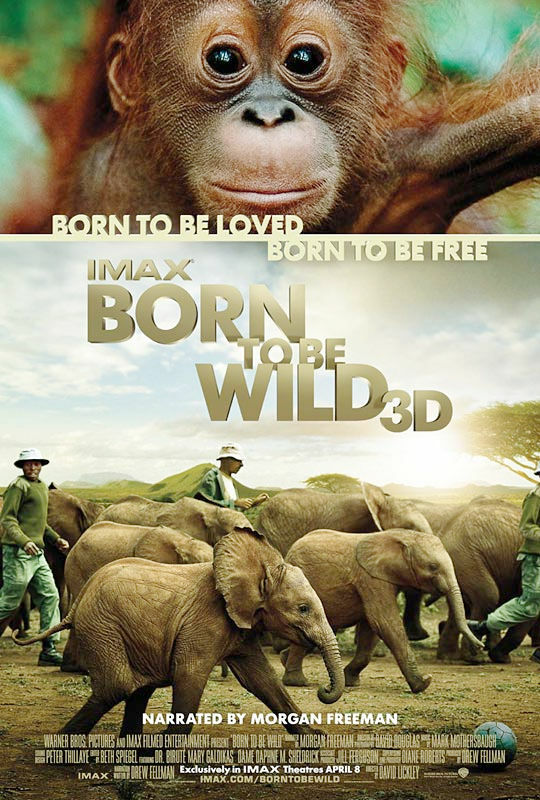 By the time Team 2 started in August 2016, enough wood had been moved into the forest that the volunteers could start living and working at Post 17 rather than commuting from Camp Leakey. But because the post had yet to be repaired, this meant using a makeshift, uncovered toilet in the forest, bathing in a shallow stream, and sitting around a campfire for meals every night. The team endured cramped conditions and limited protection from insects and rain. Their work was mostly focused on carrying the rest of the wood to Post 17. They surprised us with their ingenuity in creating effective techniques to get the work done. Near the end of Team 2’s time they joined two Indonesian carpenters on construction. Thanks to the incredibly hard work of both construction teams, Post 17 is now back up and running! Patrols of OFI rangers, police, and National Park rangers based out of Post 17 have already been ongoing for weeks, with great success. Stay tuned for more detailed information and anecdotes about Post 17 and OFI’s recent efforts to reestablish more vigorous patrols in Tanjung Puting coming soon! Despite all the difficulties these volunteer teams had to put up with, they displayed an awesome penchant to overcome, support each other, and find joy in their experience. Work hours were spent laughing and finding good humor through the difficulties. Late afternoons saw quiet hours, washing and reflecting by the river, sometimes with orangutans nearby attempting to steal soap. Evenings were spent laughing, dancing, and playing card games along with OFI staff. Two birthdays were celebrated. Many friends and memories were made. I had the pleasure of co-coordinating Team 1 along with Céline Vincart – who had herself been a construction volunteer twice before – and I can’t express enough appreciation for the excellent job she did coordinating Team 2 largely on her own. We were both honored to work with such a selfless, dedicated, fun group of people. 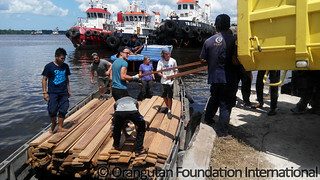 To “Team Pikul” and Team “Laba-laba”, thank you from all of us here with OFI, and from the orangutans. As OFI’s President, Dr. Biruté Mary Galdikas, is fond of saying: Thank you from the bottom of our hearts. Amazing work! I’d LOVE to go as well! Soiled you have so many hard working volunteers . . .
My daughter, Victoria Peters was on team 1. This experience has changed her life and I’m forever grateful she had the opportunity to be there!!! What an inspiring story & project! Are there plans for similar work parties in the future, or other volunteer opportunities? How do people apply?